Report: Attacks by B-1 bomber "did not adhere to all of the specific guidance"
WASHINGTON (CNN) -- The U.S. military's use of airpower in a fight in Afghanistan was "appropriate" but it did kill civilians unintentionally, a U.S. military investigation concluded in a report released Friday. 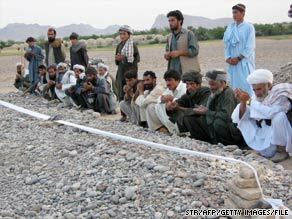 Villagers pray at a mass grave in early May after airstrikes in Afghanistan's Farah province. The report on the May 4 incident in Farah province was issued by U.S. Central Command a day after a reporter questioned the secretary of defense about its release. The incident, in which the United States used fighter jets and a bomber to support U.S. and Afghan troops in a fight with Taliban insurgents, has been controversial because of the civilian casualties. The investigators concluded the reason that civilians died likely was that guidelines for conducting airstrikes in support of ground troops had not been followed. "The use of military force in this engagement with the Taliban was an appropriate means to destroy that enemy threat within the requirements of the Law of Armed Conflict," the report said. "However, the inability to discern the presence of civilians and avoid and/or minimize accompanying collateral damage resulted in the unintended consequence of civilian casualties." The investigators found that although airstrikes during the day by FA-18s followed guidelines, later bombings by a B-1 bomber "did not adhere to all of the specific guidance." "Not applying all of that guidance likely resulted in civilian casualties," the investigators concluded. However, investigators did not recommend curtailing future airstrikes, but suggested instead that further efforts be made to minimize civilian casualties. The investigation concluded that at least 26 civilians and 78 Taliban fighters were killed. But the investigators said they will never be able to determine the civilian death toll with certainty and did "not discount the possibility that more than 26 civilians were killed in this engagement." The U.S. military has previously said that air support called in by U.S. troops hit a compound where both civilian and Taliban fighters were sheltered. The government of Afghanistan said more than 100 civilians were killed and a report by the Afghanistan Independent Human Rights Commission concluded as many as 86 civilians, the U.S. Central Command report noted. Two U.S. personnel, five Afghanistan policemen and two Afghan soldiers were wounded and five Afghan policemen were killed in the battle, the report said.